I am always on the pursuit of clear skin and even though I am in my 30's now, annoyingly I still suffer from tiny little spots that flare up every now and then. I change my skin care products quite frequently as I find that my skin always reacts really well initially to a new product, but then after a while, it gets used to it and starts playing up again! My problem areas, like most people tend to be around the nose, cheeks and chin area. A few weeks ago I was in Boot's and they had a 3 for 2 offer on all skincare products...like a fish on a hook, I was reeled in and before I knew it my basket was full! 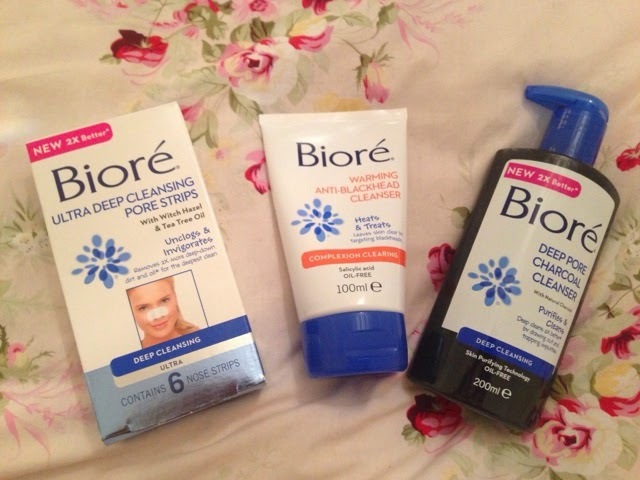 I was intrigued by the Biore range and decided to buy three products from them (above). I was very intrigued by this thick looking, black liquid in a pump action bottle. 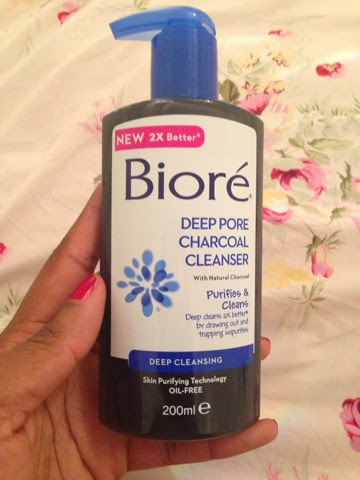 It is described as giving a deep cleansing, skin purifying clean and after reading the blurb on the back it was exactly what my skin was looking for. I have used this now for over a month and am extremely pleased with it. It is a thick black liquid but foams out white and has a pleasant smell. For some reason I expected this to leave my skin with a 'tingly' sensation but it doesn't at all. I visibly notice that my pores are reduced after using this and my skin feels smooth. It removes all my make up including mascara easily, the only con being that it does leave a tell-tale panda eye with the eyeliner that I use. Ok, so these are somewhat of a cult buy and I remember buying these in my early teens and trying it out. The box contains 6 foil packets of strips that are infused with Witch Hazel and Tea Tree Oil. I bought these for the specific reason of targeting the little white heads that generate around my nose area every few days. The idea is to wet your nose area completely than apply the strip, which then dries like 'paper mache' onto your nose area. Leave it on for 10-15mins and then peel off and inspect the results! I must admit that the peeling off process really, really hurts!! It sticks so hard to my nose area and it makes my eyes water as I painstakingly peel the strip off bit by bit! 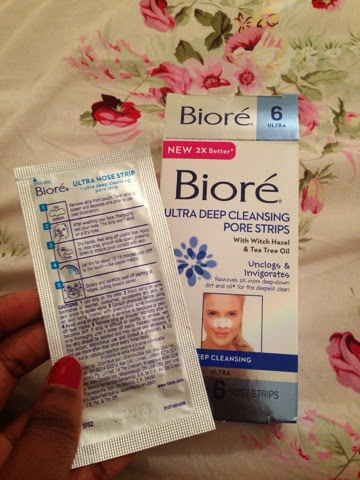 On inspection of the strip, I don't ever really see any residues (I don't suffer from blackheads luckily in this area and this is what most people see on their strips) but my nose does always look smoother and with less open pores so it is doing something! Ooooh, I just love this self-heating cleanser! It works in a very similar way to the Sanctuary Spa 5minute Detox Mask that I reviewed here before. To use this one, apply with dry hands onto wet face and it gives such a comforting hot sensation almost immediately - perfect for wintery cold mornings/evenings! 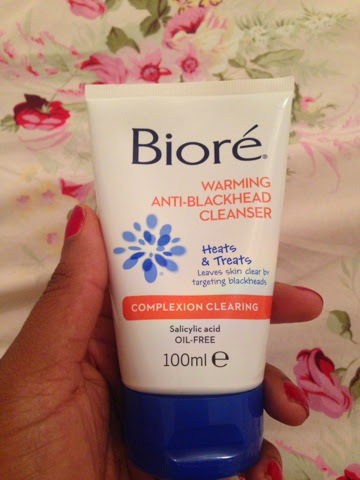 It also has scrubbing micro beads, so my skin really feels like it is getting a great exfoliation as well as pores being opened to draw out impurities. I use this cleanser about once a week as a little mini-treatment for my skin. Along with my new serum, the Vichy Idealia Life Serum that I reviewed here a few weeks ago, I have seen a massive improvement in my skin. It is brighter, smoother and with less targeted outbreaks as before, so all in all, I am a happy bunny!